Connecticut’s Ryan Eriquezzo has picked up a cheque for $191,194 and a gold ring for the “biggest win of my life” after taking down the World Series of Poker Circuit (WSOPC) Caesars Atlantic City main event. The 27-year-old pro outlasted 640 other competitors in the $1,600 buy-in No-Limit Hold’em event that offered a prize pool of $923,925 to ultimately defeat good friend David Zeitlin in their heads-up clash that left the runner-up from New York with $118,307. Additionally, the 10th WSOPC champion of this season also wanted to stress that “this was as tough a table as I’ve played and I could not be happier” after outlasting a fine collection of pros at the nine-handed final table. This victory is, in fact, his second WSOPC gold ring success after collecting $34,656 for winning event #1, a $340 buy-in No-Limit Hold’em tournament, at the Harrah’s New Orleans Bayou Poker Challenge stop back in May of 2010. The final table also saw West Virginia’s Troy Erickson take third place for $86,774, Garry Gates, of Nevada, exit in fourth for $64,530, New Jersey’s Eugene Fouksman secure $48,638 in fifth, New York State’s Roland ‘Speedy’ Israelashvili pick up $37,148 in sixth spot, Jeremy Halaska, of Ohio, collect $28,744 in seventh, Canadian Ryan Higgins take eighth for $22,533, and Long Beach’s Tyler Kenney leave with $17,888 for ninth place. Incredibly, the next highest placed non-American was another Canadian Alemu Makonen, with the Edmonton native cashing for $4,999 down in 30th spot. However, this event belonged to New Haven’s Eriquezzo as he secured his biggest ever live tournament cash to overshadow the $71,978 he collected for winning the $1,000 buy-in No-Limit Hold’em Six-Max event at last year’s Borgata Winter Open – also in Atlantic City. Day 3 started with 22 players still in with a chance of WSOPC glory, but it all came down to Eriquezzo versus Zeitlin after Erickson had been knocked out in third place by the eventual runner-up. Eriquezzo held a slightly-better-than 2 to 1 chip advantage over Zeitlin with 8.8 million to four million and, although they fought it out for almost two levels, the former eventually prevailed. The final hand – during level 32 with the blinds at 50,000/100,000 and a 10,000 ante – saw Zeitlin four-bet jam with 2♦ 2♠, while Eriquezzo called to show K♣ J♣. The flop of 6♠ 10♦ 8♠ gave Eriquezzo no help, while the 5♠ turn card removed two of his outs to leave him needing one of the two jacks and two kings still available. Lo and behold, the K♦ arrived on the river to give Eriquezzo top pair, the title, a gold ring and the big cash prize – as well as a spot in July’s National Championship in July as part of the 43rd WSOP in Las Vegas. Eriquezzo will be joined by 99 other WSOPC players at the Rio All-Suite Hotel & Casino for the July 6 start of the three-day event as they all try to win a WSOP bracelet and $1 million as the last man – or woman – seated. Back to the latest WSOPC main event, New York State’s Kenney was the first player to exit the final table when his pocket nines couldn’t see off Higgins ace-queen. Kenney, in middle position, moved all-in for 375,000, with the action folding to small blind Higgins, who re-shoved. Eriquezzo folded for Kenney to reveal 9♣ 9♠ while Higgins, of Deux-Montagnes in Quebec, tabled A♣ Q♠. Kenney would have been happy to see a flop of 4♥ 6♣ K♥, but distraught to witness the Q♦ spike on the turn to give start-of-day chip leader Higgins a better pair. The 6♠ river was no help to Kenney and the 22-year-old was gone. An amazing nine successive all-ins resulted in double-ups before – four hours after the elimination of Kenney – Higgins himself busted out at the hands of Eriquezzo. In early position, Higgins open-shoved his remaining 430,000 chips into the middle, while Eriquezzo called before the action folded and the starting hands tabled. Higgins showed 3♦ 3♣, but was a massive underdog to Eriquezzo’s 8♣ 8♦ – and nothing changed on a board the read K♣ A♠ 9♠ J♦ J♠ to leave the Canadian disappointed to fall in eighth place from starting the final day in such a strong position. All the while, Eriquezzo had managed to accumulate 3,050,000 in chips – but topped that milestone with probably the best hand of the whole event just minutes later that saw him take an even greater chip lead. In the hijack seat, Eriquezzo opened for 130,000, Israelashvili called from the button, and Gates defended his 60,000 big blind by also calling. The dealer revealed a flop of 7♥ 4♥ 5♣, and Eriquezzo made a continuation-bet of 175,000. Gates made the call, before then check-calling 295,000 on the 7♠ turn, and 520,000 on the 2♣ river. Incredibly, Eriquezzo showed 7♦ 7♣ for quad sevens, while a smiling and good-humoured Gates mucked his cards as he slipped to 985,000 and his opponent moved up to 4,550,000 in chips. Halaska was Eriquezzo’s next victim as the North Olmsted player hit the rail in seventh place. Eriquezzo opened for 130,000 and, with the action folded to Halaska, he moved all-in, only for Eriquezzo to snap-call with A♦ A♥. Halaska showed A♠ Q♥ and could only look on as the dealer displayed 5♦ 10♣ 9♦ 10♦ K♥ to be eliminated. Sixth place went to Forest Hill’s Israelashvili after seeing his stack demolished by Las Vegas-based Gates and then finished off by the same player the very next hand. In the first of those two devastating encounters, 30-year-old Gates three-bet all in against 54-year-old Israelashvili, who made the call to show J♠ J♦. Gates held the A♠ Q♦ to be behind, with the 4♦ K♦ 5♣ flop and 8♥ turn changing nothing – only for the A♦ to spike on the river for the winning pair to leave Israelashvili with just 135,000 chips. He got those chips in on the following hand, with Gates, Eriquezzo and Zeitlin all calling as they checked down the board that read 4♥ Q♣ J♣ 7♥ 9♥. The 2010 winner, Israelashvili – who was at his third consecutive WSOPC Caesars Atlantic City main event final table – showed 8♠ 6♠, but lost his last few chips to Gates, whose K♦ Q♥ was the best hand with a pair of queens. 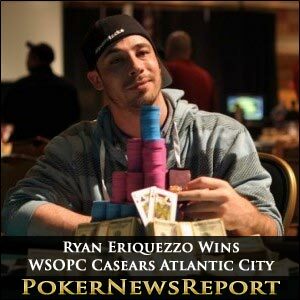 Eriquezzo then knocked out Gates – a respected poker writer and journalist – and Fouksman in fourth and fifth places respectively a couple of hands later. Ukrainian-born Fouksman, in the cut-off seat, started the action by shoving all-in, before the action moved on to Gates on the button. He took a few moments to consider his options before also shoving, while big blind Eriquezzo called as he eyed up a double elimination. Eriquezzo tabled J♣ J♠, Gates showed A♦ K♣ and Manalapan’s Fouksman revealed A♥ 7♦ ahead of a board of 4♥ 9♠ 5♣ 10♦ 8♣ that saw the eventual champion’s jacks hold as he moved past the five million chip barrier. Third place went to 47-year-old nightclub owner Erickson after Zeitlin called the Martinsburg native’s all-in pre-flop move. Unfortunately, for Erickson, the A♠ Q♥ of Zeitlin hugely dominated his A♥ 3♣, before the flop ran out 8♥ 8♣ A♣ flop – much to the relief of Zeitlin. However, the K♠ turn gave the players the same hand – only for the K♣ to spike on the river to again give Zeitlin the best hand with the better kicker, a queen, and eliminate Erickson as the two players gave each other a big hug. Thereafter, there was a 10-minute break before best pals Eriquezzo and Zeitlin battled it out for the title. Tenth place and $14,382 went to 29-year-old Philadelphia pro Aaron Overton for his first WSOP-related top-10 finish, while – with 73 places paid – Delaware’s Alok Arora left with $1,305. The next leg of the WSOPC pulls into San Diego, California, tomorrow for the Harrah’s Rincon stop that ends on March 26. This 12-day series of events will feature a $1,620 buy-in re-entry main event that kicks off on Sunday, March 24, until the 26th.